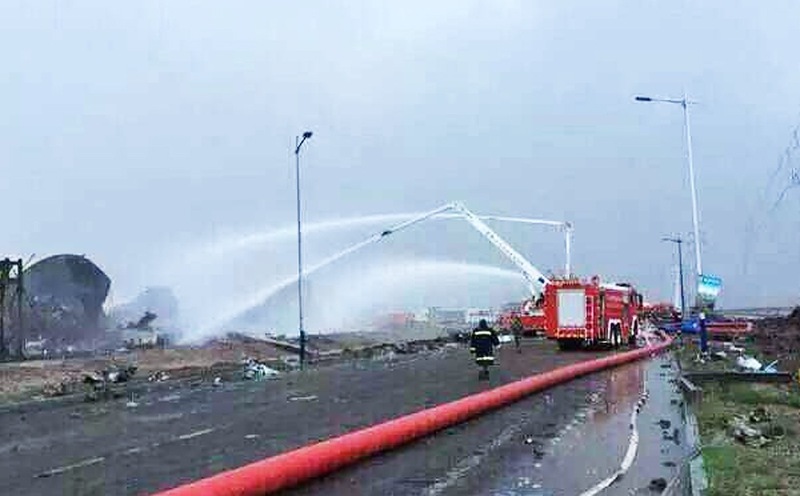 Beijing (AP) – After the terrifing explosion in Tianjin of the past weeks, a chemical factory exploded in Shandong province late on Monday night, killing one person. The blast was the second chemical plant explosion in the province in just over a week. It remember dramatically the explosion that happen in the city of Tianjin. The Dongying News website – run by the Dongying city government – said the factory in Lijin county exploded at 11.22pm on Monday and the fire was brought under control about five hours later. It also reported that six executives at Shandong Binyuan Chemical Company, which runs the factory, have been detained and that the cause of explosion was now being investigated. Firefighters are still at work on the field. The company, located in the Lijin Binhai Economic and Technological Development Zone, said on its website that it had the capacity to produce 20,000 tonnes of adhesive materials annually. No one at the company was available to comment. Calls to the Lijin county propaganda department were not answered. People answering calls made to the police and fire departments said they had no further information. The blast area is 300km away from Tianjin, where the huge explosions on August 12 at a warehouse area storing hazardous chemicals killed at least 158 people, many of whom were firefighters. The warehouse area was also closer to apartment buildings than is permitted under Chinese safety regulations covering the storage of dangerous materials.